In order to formalize the beginning of their partnership, a certificate is presented by Me Jean-François Latreille and Me Maria Karteris (center left) to M. Christian Schryburt, president of the board of directors, and Mrs Dominique Massie, executive director (center right) surrounded by members of their teams. Since its foundation, in 2003,the firm DUBÉ LATREILLE works hard to make a difference. This aim applies not only to the steadfast defense of its clients’ interests, but also to the various organizations where its members are involved and distinguish themselves. This year, while celebrating it's 15th anniversary, DUBÉ LATREILLE has decided to concentrate its efforts to support a specific cause in order to illustrate in a concrete manner its determination to contribute to the betterment of our society. 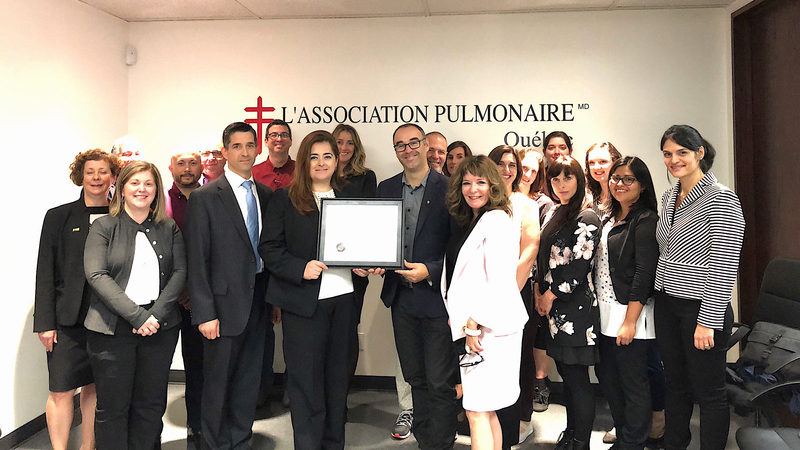 This is why a partnership has been formed between DUBÉ LATREILLE and the QUEBEC LUNG ASSOCIATION (QLA), a reputable non-profit organization that fights relentlessly lung diseases inQuébec since 1938. This partnership was officially inaugurated on Tuesday, September 25, 2018, at the head office of the QLA in the presence of several representatives of both parties.